In this month’s wrestling events, the Cardinals sent a powerful message as they fought their way to a fourth-place finish in the season-opening tournament at the Roger Williams Invitational on Nov. 10. 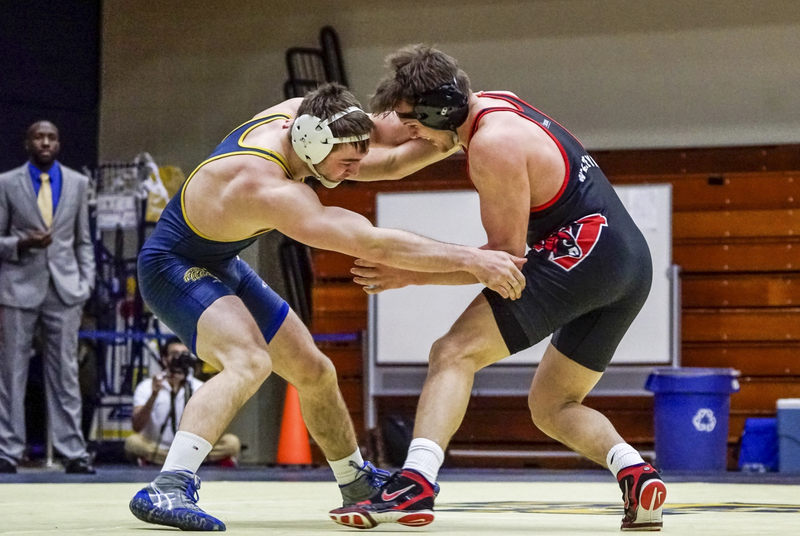 The Cardinals collected as many as 96 points, behind only the wrestling powerhouse Johnson & Wales University (153.5), host Roger Williams University (132), and Messiah College (108). Among the featured 12 wrestlers across nine different weight classes, Dylan Jones ’19 established himself as the team’s highest individual placer, finishing in second place at 133 with an impressive technical fall. Elsewhere, James Matias ’19 at 141 and Simon Chee ’21 at 197 both finished fourth as they faced fierce battles from two crowded brackets. While Chee registered two pinfall victories and finished with a record of 3-2, Matias won three matches straight by decision before he was unfortunately edged out by Gabe MacDaniel of Johnson & Wales (3-5 by decision) in the semi-finals. In addition, senior co-captain Zack Murillo ’19 picked up a fifth-place finish at 125 as he went 3-2 after falling to Jay Albis, last year’s NCAA National Champion. Other encouraging news came from the three sixth-place finishers, including Shane Ross ’19 at 149, who went 4-2 with a pinfall win, Roy Forys ’20 at 165, who went 4-2 with two pinfalls and two major decision wins, and the rising star Marco Gaita ’22 at 174, who won two matches in the championship bracket. The Cardinals resumed action at Doug Parker Invite on the Nov. 17 as they looked to finish strong before the Thanksgiving break. The stellar performance from Forys helped Wesleyan finish sixth among 17 strong competitors as the junior received two well-earned titles: the Most Outstanding Wrestler of the Invitational and the New England Wrestling Association (NEWA) Co-Wrestler of the Week. The host, Springfield College, took the title for the fourth time in the last six years as they totaled 111.5 points with two first-place finishers. Rounding out the top-five were Centenary University (102.5), Southern Maine University (97.5), the Coast Guard Academy (94.5), and East Stroudsburg University (88.5). Forys, who made his heroic return this season, tore through his competition at 165. Starting with a pin of Warren Young of Plymouth State University, he followed that with a comfortable 13-4 major decision win over Juan Vernaza of Southern Maine. In the third round, he unleashed a barrage of moves to pin Nick Jabs of Coast Guard in 1:25 to advance to the semifinal, where he registered another pinfall win against Marquan Payne of East Stroudsburg University. The highlight of Forys’ dominant run finally came when he faced the No. 2 ranked wrestler at 165, Nick Remke. In a hard-fought battle, Forys summoned a late charge to edge out the Coast Guard sophomore by an 8-5 decision to take home the top spot. The junior is now 9-2 this season with five wins by pin. At 133, Jones continued his fine form and went 3-1 to claim his second second-place finish, only losing to last year’s NCAA Southeast Regional Champion, Ricky Cavallo of Johns Hopkins University. Rounding out the top performances on the day were the fifth-place finisher at 125, Murillo, and third-place finisher at 149, Ross. Both of them were inches away from the title as they both went 4-1. Next up, the Cardinals will be visiting Rochester Institute of Technology this Saturday to compete in their 53rd annual invitational. While The Argus will be taking its winter break as the semester rounds up, we encourage all wrestling fans to stay in tune with Wesleyan Athletics for more updates from Scott Viera Invite, Lycoming Duals, and NEWA Dual Championships coming up in early January. Henry Yang can be reached at hyang01@wesleyan.edu.